Following on from the global success of Illamasqua’s new Skin Base Foundation, and as the ONLY truly professional make-up brand on the market, Illamasqua are so confident you’ll love the perfect complexion their foundations, powders and primers create that they invite you to join the make-up revolution! 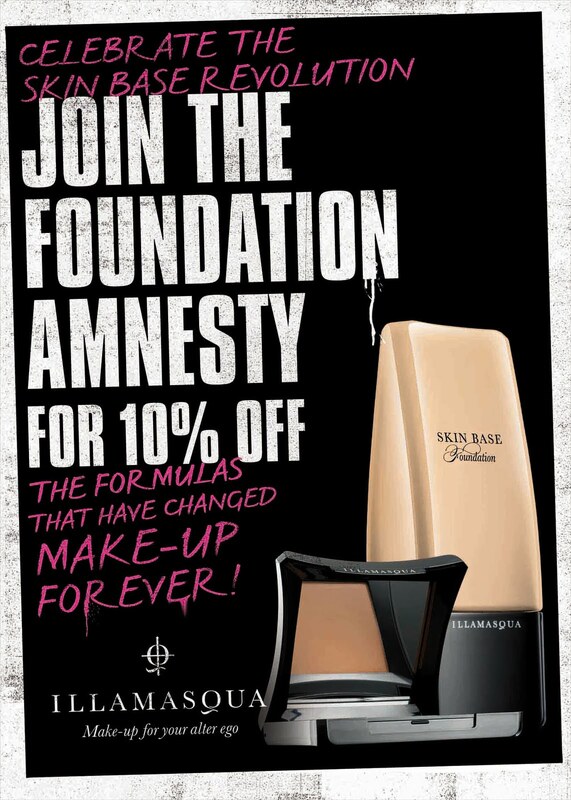 So much so, that for a limited time only Illamasqua are encouraging people to bring in their used, empty, broken or just plain unloved foundation in return for a 20% discount on any Illamasqua complexion product. 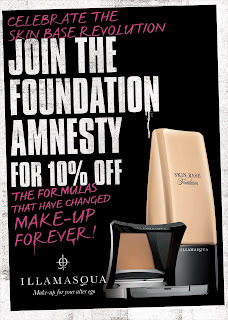 · Bring in any foundation from any brand and trade it in for an Illamasqua complexion product chosen at a 10% discount. · The 10% discount will apply to all complexion products purchased in the one transaction at any of the Illamasqua counters nationwide. · A 20% discount will apply to any of Illamasqua’s complexion products in one transaction at the Illamasqua flagship store in the heart of London, 20 Beak Street, London W1. · There is no minimum or maximum number of foundation products that can be brought in. · The foundation product can be used; empty, broken, smashed you name it. · The offer can be redeemed across Illamasqua foundations, primers, concealers and powders for complexion only.